Prop up your plates. Fit in some flowers. Organise your ornaments. Add in some artwork. A dresser is one of the most versatile furniture items you can own. Not only does it provide storage and display space, it can also be used to prop up souvenirs or ornaments you want to show off. Sometimes, versatility can create an obstacle when it comes to styling your painted dresser. To help give you some inspiration, we've illustrated six perfect ideas. Adding flowers to your painted dresser is a great way to liven things up. If you can't maintain real-life flowers, then get yourself some fake ones. Try colourful rose pots, hanging baskets, or even a bunch of bright flowers in a vase. If you already have a colour theme, then choose flowers in specific colours to match. 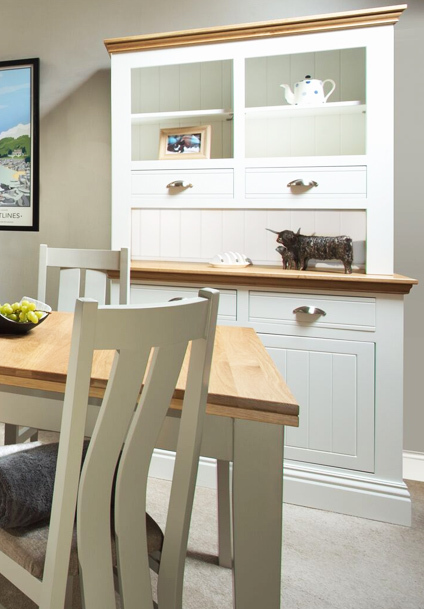 If you want to create a more calm and classic look, you should keep everything in a single colour. Even multiple stacks of ceramics or crockery won't look out of place because of a consistent colour. You could even bring in a pop of colour with a couple of items, which will add interest without detracting from the overall white-on-white look. Try a simple set of white lights to add a hint of elegance to the dresser. With such an array of lighting options to choose from today, adding a touch of sparkle to your painted dresser has never been easier. It's perfect for living rooms or bedrooms to switch on in the evening. It will also help draw attention to any pretty objects you have displayed. Mix vintage finds with modern furniture to create an eclectic, worldly and uniquely personal look. That old Egyptian ornament from your holidays? Vintage teacups from your grandmother? Anything old, unique and that has a story is perfect to style your painted dresser. If you stick with a white theme, it's the perfect way to add a touch of class and style to your room. Pick one theme and commit to it; if you go in half-hearted, it won't have the same impact. 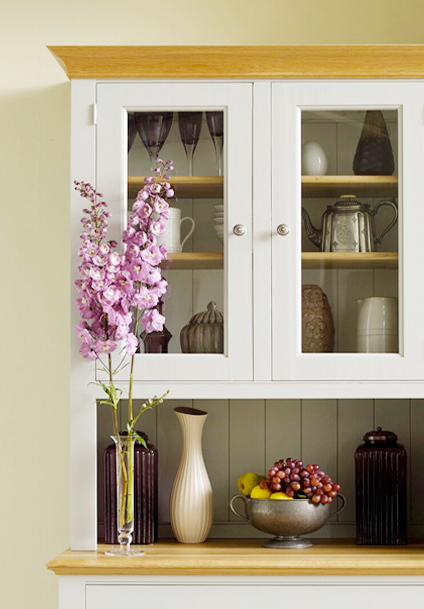 A dresser is a perfect place to display your favourite ceramic collections. Fill up the entire display area with one collection and you will create a dramatic impact. Blues, orange and pink collections always go well with a white painted dresser. Or pink ceramics go well with a blue painted dresser. There's something reassuringly old-fashioned and wholesome about it. If fairy lights aren't your thing, then why not add some classic bunting. 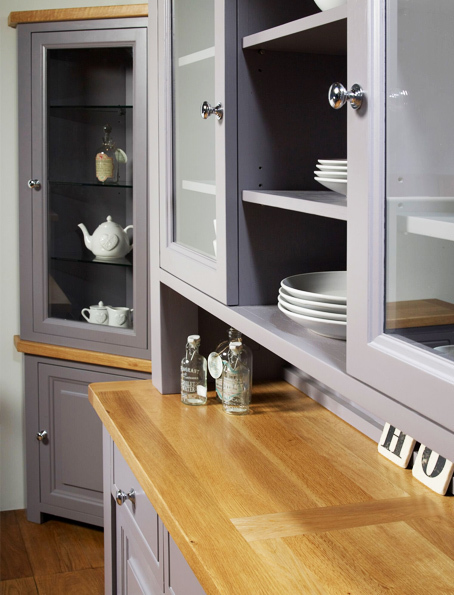 You can choose a colour scheme that matches the items already on your painted dresser. Try a vintage fabric or floral tones to create a cosy theme.